Moseley Road Baths in Balsall Heath, Birmingham is a well loved and used Edwardian Swimming Pool of huge historical and architectural significance. Pool 2 is used all week round by the whole community (timetable here), whilst the Gala Pool has been closed since August 2003. 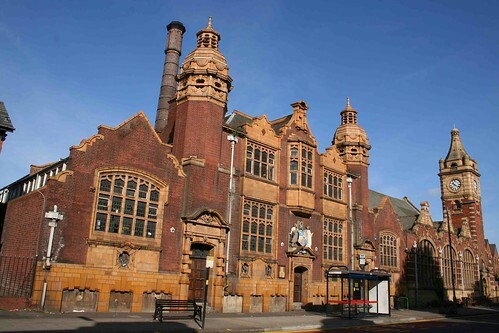 Moseley Road Baths were scheduled to close in Summer 2017. The Moseley Road Baths Action Group (‘MRBAG’ – a wider group that included the Friends of Moseley Road Baths) came together to look into other ideas for keeping the Baths open. This Action Group came up with a plan to run the Baths as a community venture, and after lots of discussions, the City Council agreed to let the Action Group have a go. The organisation in charge will be the Moseley Rd Baths C.I.O. Read more about the Action Group and new CIO here. If interested please contact Karen Leach on keepswimming@moseleyroadbaths.org.uk or call the pool number 0121 439 0320 and leave a message for Karen Leach. To get involved in the campaign contact us at contact@friendsofmrb.co.uk and keep an eye on the ‘campaign’ page and blog of this site. You can also sign up for our regular newsletter to have all news and events sent straight to your inbox. Meetings are held every two months in the Tea Room at the Baths – details of the next meeting can be found on our Events page.